We (Japanese people) love daikon and there are so many dishes which feature daikon as a main ingredient. "Furofuki daikon" is one of signature daikon dishes which Japanese people are all so familiar with. 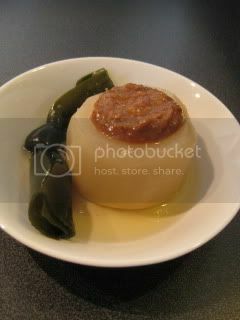 Typically, it's simmered daikon in light broth, and served with miso sauce. 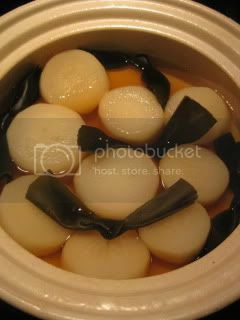 But, I saw a Japanese chef, Kennichi Nishi (one of the most highly-respected chefs of traditional Japanese cuisine), showing his way of making Furofuki Daikon on a Japanese cooking program, in which he was steaming daikon to precook it before simmering! 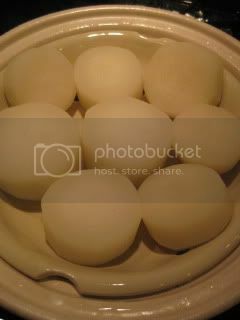 Conventionally, to make Furofuki Daikon, we are supposed to precook daikon by boiling in reserved water from rinsing rice. I used 1 medium-size daikon. Peel the daikon and cut into 2" thick disks. Trim the edge. 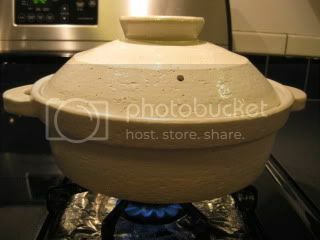 Steam in Mushi Nabe for about 30 minutes or until daikon is tender. 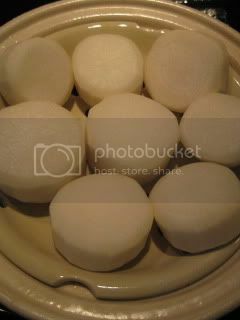 Once daikon is steamed, remove from donabe. Also remove the grate and drain the cooking water. Fill the donabe with 2C dashi stock, then add the steamed daikon and some tied kombu (for stew). Put a drop-lid (or a piece of parchment paper) over the daikon and cover with lid. Simmer for 5 minutes. Add 1tsp usukuchi shoyu (light-color soy sauce), and simmer for additional 10-15 minutes. Remove from heat and let it rest for 10 minutes. To make the miso topping, in a small pan, combine 1/2C red miso (I used my homemade), 1/4C saikyo miso, 3T sake, 3T water, 1/2T raw brown sugar, and 1tsp mirin. Whisk over medium-heat for 15 minutes or until nicely thickened. Add some yuzu rind (optional). To serve, plate the daikon and kombu with some broth. Top the daikon with some miso sauce.